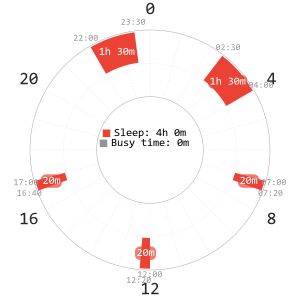 The dual core (DC) family of sleep schedules was originally proposed by the Polyphasic Society based on Segmented sleep. Instead of having a single long core, the core sleep is split up into two parts, with the first part being dominated by SWS, while the second part is primarily comprising of REM sleep. The dual core schedules then distribute sleep into additional 20-minute naps during the day to allow for an alleviation of REM from the cores and providing refreshment during the long wake period. These schedules are typically considered to be more difficult to adapt to than Everyman, however if one is naturally and regularly waking up during the night there is a chance they are naturally inclined toward dual core schedules. Dual core schedules could turn out to be the easier route for these people. Difficulties arise from shorter cores due to splitting and cycle compression, and during adaptation it can be very hard to stay awake in the core gap. As with the Everyman line, extra tiredness is also introduced until SOREM has been achieved in the naps. The dual core schedules are also not as well known as the Everyman schedules due to their lower popularity. The increased sleep quality that comes from segmenting the cores into the SWS and REM peaks allows for further sleep time reduction compared to single-core schedules. Like with Everyman schedules, each variant of Dual Core is numbered based on how many naps it contains. So, for example, a Dual Core schedule containing 2 naps is consequently called “Dual Core 2” or just DC2 for brevity. This is the first Dual Core sleeping schedule, and follows logically from Segmented sleep. The second core on this schedule is reduced to a single sleep cycle in length when compared with Segmented, replacing the second cycle of the second core of Segmented with a nap. In general, while this schedule has a similar total sleep time as Everyman 2, the adaptation is considered slightly harder for people who are not naturally inclined towards dual core schedules. Ideal scheduling is to place the first core at around 9.30pm, the second core at around 6am and the nap at around 2pm. If modification is needed, the core gap could potentially be shortened a bit, but this risks moving the sleep blocks out of the favourable REM and SWS timings. Rotating this schedule is also very challenging for the same reason. If the schedule does get rotated, the entire circadian rhythm might have to shift around to compensate for the delay. This schedule follows from Dual Core 1, but with a bit more sleep time reduction. 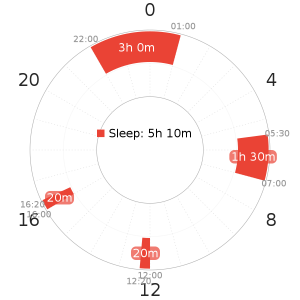 The goal on this schedule is to reach a cycle length reduction by compressing the sleep cycles down to 80 minutes, which is reflected in shorter core times (160 mins and 80 mins respectively; making the schedule 4 hours and 40 minutes long). The longer core is not significantly reduced, so the compression that can be achieved is quite small. Alternatively the first core can shorten to 2 hours and 30 minutes at the end of adaptation. This doesn’t happen for everyone though. It should be noted that the schedule proposed by Polyphasic Society recommended people to start the adaptation with a 2.5 hour first core, using a mid-cycle wake. However, that has been shown to be a less successful way to adapt to Dual core 2. An extra nap is added to compensate for the reduction of total core durations compared to Dual Core 1, because these shorter cores no longer cover as much of the REM period, so that extra REM must come from a nap instead. The total number of equivalent cycles of rest on this schedule is therefore back up to 5. Ideal scheduling is to place the first core at around 10pm, the second core at around 6am and the naps at around 12pm and 4pm. As with Dual Core 1, modifying and rotating the schedule is quite challenging and the schedule suffers from the same sort of limitations in this area. This is the shortest dual core schedule and without a doubt the most difficult. 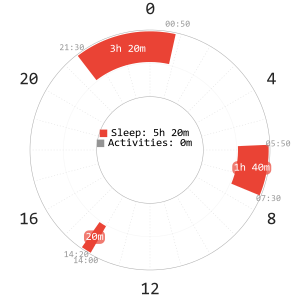 The 4 hour sleep total is on the border of the minimum sleep threshold, and most people will likely find this schedule harder than E3 because of the split core. The two short single-cycle cores can result in a significant sleep cycle compression, down to as short as 60 minutes. This would make each core 1.5 cycles long. The first core will account around 65% of the daily SWS and the high level of cycle compression could result in SWS wakes from that core during adaptation, making it even harder to stay awake during the graveyard hours due to sleep inertia. The second core will have a more balanced amount of SWS and REM, with marginally more REM, and is consequently most likely to have REM or light sleep wakes. The three naps add up to complete the remainder of the daily REM total. Ideal scheduling is to place the first core at around 10pm, the second core at around 2.30am, and then to place REM-targeted naps at around 7am, 12am and 4.30pm. Unlike with previous dual core schedules, the second core here is intended as a mixed core and can be placed further away from the REM peak because the remaining REM will be covered by the three naps. This schedule doesn’t really resemble the previous dual core schedules, and adapting gradually to it through any of them could prove to be rather difficult.